There is an important association between maternal cigarette smoking cessation during pregnancy and risk of preterm birth, according to a new Dartmouth-led study published in JAMA Network Open. James O’Malley, MS, PhD, a professor of The Dartmouth Institute for Health Policy and Clinical Practice and of biomedical data science at the Geisel School of Medicine and director of the Program in Quantitative Biomedical Sciences, has received the 2019 ISPOR (International Society for Pharmacoeconomics and Outcomes Research) Award for Excellence in Health Economics and Outcomes Research Methodology. 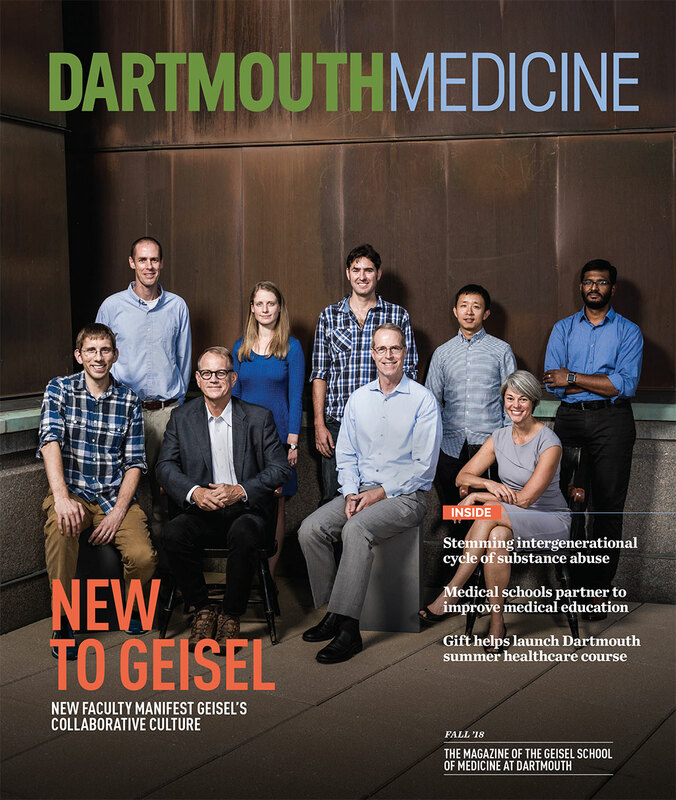 Findings from a Dartmouth-led study published in the journal Science Translational Medicine, are offering new insights into neonatal herpes, its impact on developing nervous systems, and how newborns can be protected from the disease. In this innovative study, investigators were able to measure not only mortality but also neurological consequences of infection in mice who acquired the virus. Geisel first-year students and Sweitzer Fellows Shuaibu Ali ’21 and Kenny Williams ’21 are partnering with classmates and local high schools to offer Upper Valley STEM Scholars. The program allows students to gain exposure and mentorship in STEM fields like medicine, while learning how societal issues impact the health of communities. Anne Schuchat MED ’84, the principal deputy director of the Centers for Disease Control and Prevention (CDC) and a retired rear admiral from the Commissioned Corps of the U.S. Public Health Service (USPHS), will be the featured speaker at Geisel’s 2019 Class Day Ceremony, which will be held Saturday, June 1 at the Hopkins Center’s Spaulding Auditorium. Have you been wondering if there are enough eligible patients to support your study? Find out using Dartmouth i2b2—the patient cohort discovery tool! SYNERGY Clinical and Translational Science Institute will provide an overview of i2b2 this Friday, March 22 from 9:00 to 10:00 AM in Auditorium H at DHMC (includes a light breakfast). Part of the SYNERGY Spring Research Informatics Workshop Series, the session will include a basic introduction, sample queries, and how to get an account. To register, go to: https://is.gd/Information_Request. This spring, SYNERGY Clinical and Translational Science Institute will be running a series of workshops at Dartmouth-Hitchcock (from March 22 through May 31) for two informatics tools: REDCap and i2b2. REDCap is a secure web application for building and managing online surveys and data. Dartmouth i2b2, the patient cohort discovery tool, will allow you to answer questions like: Are there enough eligible patients to support my study? How many patients are taking a certain medication? For how long? Sandra L. Wong, MD, MS, the William N. and Bessie Allyn Professor in Surgery at the Geisel School of Medicine, has been named president-elect of the Society of University Surgeons. Deborah Hogan, PhD, a professor of microbiology and immunology at Dartmouth’s Geisel School of Medicine, has been named a 2019 Fellow of the American Academy of Microbiology based on her record of scientific achievement and original contributions to the field of microbiology. Global health teams from Geisel and its partner organizations held a symposium in Dar es Salaam in December to provide critical updates in TB care, prevention, and research. The event was the latest step in their 17-year history of working collaboratively to combat HIV-related TB in Tanzania.